I had no idea that the Littlest Pet Shop was still going. I remember my sister being really big into it when we were kids so its cool to see there is still a large following for the brand. What does my life story have to do with this game? Well nothing really so please read on to find out if this is a game that your kids (or maybe even you) can get into. I really have to say that this game looks fantastic. It’s bright and colorful and the characters, all of whom I am sure fans of the Littlest Pet Shop will instantly recognise, look great. This is a game for kids, and the games art style is clearly aimed at that, and it does it very well. It is my understanding that the characters in this game are lifted right from the Littlest Pet Shop animated series that is currently on TV. The idea of the actual game is to collect and set up homes for a range of pets. It has a great tutorial that I am sure the majority of kids will be able to easily understand. I love it when a game for kids has a tutorial that is also aimed at the kids and not the kids’ parents. It is the characters from the TV show who will be walking your kids through the tutorial. There is a great range of animals that you can adopt into your little pet haven. There of course are cats and dogs, but there are also animals like monkeys, pandas and even some lizards so no matter what kind of animal your kids adore there will be something here for them. When you bring a new pet into your home, you can then buy things for their new place that they can play with and interact with. For example you can buy a slide for them or maybe a ball. Or if you really want to spoil them then why not spring for a swimming pool? Once you have a new pet the fun does not stop there. You can interact with them in a few different ways. You can groom them to make sure that they are nice and clean. Of course you will need to feed them, and you can even play little mini games with them. Your animals can level up when you do things with them, and leveling them up and playing with them will earn you in-game currency, or as it’s called here, “kibbles”. Kibbles can be used to buy a variety of accessories. Of course to get some of the cooler stuff you will need to use real money which the game calls bling. Now to be fair the game does reward the player with some bling for completing tasks, but not very much. 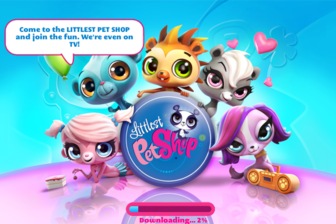 Littlest Pet Shop is a wonderful game for kids. It is free to download, and while you can use real money to buy items, it is worth noting that it is possible for your kids to have a great deal of fun without ever needing to spend a penny.